Thinking of ways to support your product organization? The Do-It Corporation’s hang tabs are a great way to create retail displays that not only assist in the amount of product you’re able to put out, but also help with the organization of your displays. The Do-It Corporation is no stranger to creating effective and profitable retail display solutions, and we guarantee that our hang tabs will make your displays more organized. Sometimes, too much of a good thing can be a bad thing, and this applies to retail displays. If you have too many your products crowding a shelf, you can lose visibility of your product in the surrounding items. By hanging your product from Do-It’s dependable hang tabs, you can get the perfect amount out that is visually appealing and noticeable. When deciding on the hang tab that best suits your products, you can choose ones that not only organize your products effectively, but also keep them safe. 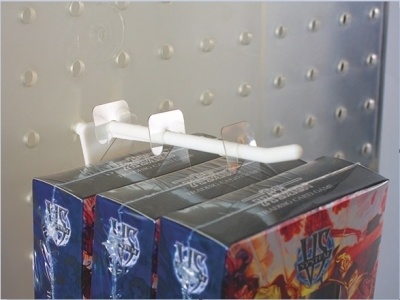 The security hang tabs from Do-It give your product packaging the extra seal to keep people from easily opening them, protecting your products. The security tab is more durable than wafer seals and can give you the peace of mind you need while fixing product organization. The Do-It hang tabs have different designs made for different sizes of products, so you can get the perfect match to help with your product organization. Whether it’s our hook tabs displaying more than one size or color of the same product, or our round hole hang tabs hanging smaller, lightweight items, there’s sure to be one to help bring organization when hanging your products. The Do-It corporation is your one-stop-shop for all marketing displays, product organization tools, and display solutions. With over 40 years of experience, you know you can trust the professionals at Do-It.